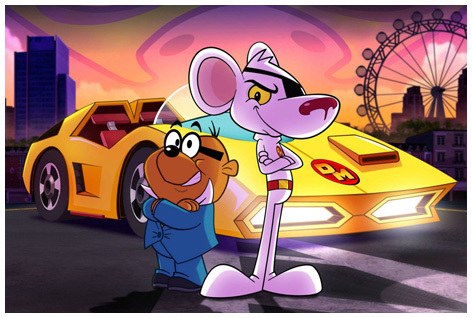 Thanks to the CBBC TV channel, Danger Mouse returns to the small screen in 2015. As an iconic animated series that ran from 1981 to 1992, the show has received something of a cult following amongst the show's millions of worldwide fans. The lead character was originally voiced by Del Boy himself, David Jason. Whilst a small selection of Danger Mouse toys, mugs, posters, keyrings and dressing up outfits can still be purchased online, the fans are already getting excited by a new product range that will hit retailer's shelves on the shows return. Our Danger Mouse toys blog tracks news of all new merchandise. The BBC has already announced that Danger Mouse's famous eye patch will be replaced with an i-patch. According to inside sources, this will be capable of some amazingly cool things! Whilst purists may bemoan these 21st century changes, watch out for some sophisticated toys and gadgets to link up with the programmes latest story lines. Toy company Jazwares were appointed by Freemantle to handle all toy designs and sales for the new TV series. Their innovative design team are creating some exciting new products to be launched alongside the new show. Major book publisher Penguin are also in on the action have been commissioned to launch a series of publications including comics and books.